Do you believe in miracles? Do you believe in music? 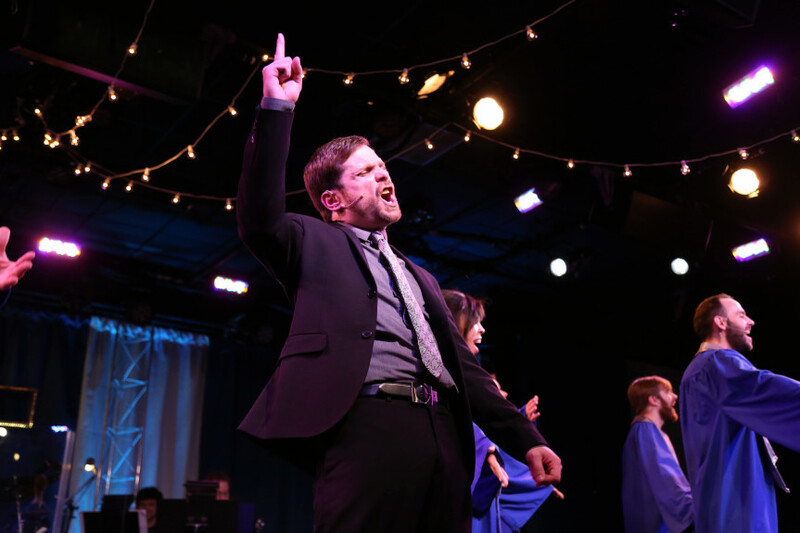 You will after seeing Leap of Faith at Minneapolis Musical Theatre (through May 22 at the New Century Theatre). MMT's production features the Twin Cities Community Gospel Choir. Need I say more? Can I get an amen? Can I stop asking rhetorical questions? Matt Tatone, working the crowd into a frenzy. 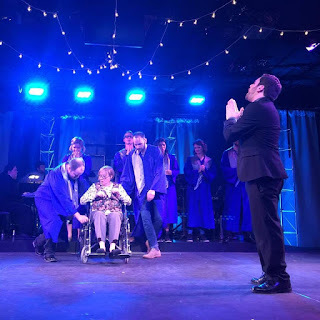 Jonas Nightingale (Matt Tatone) is a preacher/con artist who brings his musical "Angels of Mercy" from town to town setting up revivals, faking miracles, and collecting funds from the townspeople. Jonas's sister Sam (Jill Iverson) is his somewhat skeptical partner in crime. Ida Mae Sturdevant (Sonya Nolen-Moon) is the star performer of the group and her children, Ornella (Brianna Graham) and Isaiah (Brandon A. Jackson) differ widely on issues of faith. When Jonas and his Angels get stranded in the depressed, drought-stricken town of Sweetwater and meet Sheriff Marla McGowan and her wheelchair-bound son Jake, well, things get interesting. I have so much good to say, I don't know where to start. Forgive the mildly incoherent raving to follow. The cast is outstanding. Matt Tatone as Jonas gives a full-out, no-holds-barred performance during the revival scenes, leading the proceedings with utter commitment and wild energy. His performance made me think of Hugh Jackman in The Boy from Oz, who worked so hard in that show that he was whippet-thin. (So, someone make sure to feed Tatone, okay?) Yet in his scenes with his sister and with Marla, Tatone creates the perfect combination of charming, seductive con with a thin veneer of slime. Brianna Graham and Angels. Photo by Lisa Persson. Jill Iverson as his sister Sam, in a non-showy role, provides deadpan humor and the voice of reason, while singing the heck out of her songs. Emily Jansen as Sheriff Marla perfectly depicts the no-nonsense sheriff with a soft spot for a charming con, and her relationship with her son (Andrew Hey, possessed of an angelic voice) is realistic and believable. Sonya Nolen-Moon, as Ida Mae, anchors the proceedings and the music with gravitas, sparkle and a gorgeous voice. Her daughter (Brianna Graham) has a dynamic presence and a powerful voice as well. And then there's Isaiah. Brandon A. Jackson plays Ida Mae's highly devout son Isaiah who disapproves highly of everything Jonas and the Angels are doing. Far from being a one-note, stuffy buzzkill, Isaiah's side (and snide) comments are delivered hilariously. His voice is sublime. In the second act, he solos in a song called "Are You On the Bus?" and sings the hell out of it. (Literally?) In opera, there's a controversial convention in which a performer will encore a particularly well-sung aria. (Most recently, Juan Diego Florez encored his "Ah, mes Amis" aria from La Fille du Regiment.) I think this convention should be brought back SOLELY so we can hear Jackson sing his part of "Are You On the Bus?" again. It was staggering. Is it a miracle? Photo by Lisa Persson. The entire ensemble is marvelous, and used beautifully. They shift seamlessly between portraying Angels and townspeople, with only a few minor costume changes. 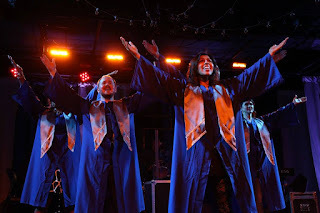 The dancing is full-out and energetic, and the music (provided by a rocking onstage band featuring Paul David Stanko, John P. Imgrund, Bill Crean, Ginger Larson, and Alex Maiers) is used perfectly to heighten the preaching. And the SINGING. A few more technical details: The theater is set up as the interior of the revival tent, and the audience are the townspeople, which creates a powerfully direct link between audience and performers. The set (by Darren Hansel) is spare, but works perfectly. The lighting (by Grant Merges) makes it crystal clear when the revival is in full swing. Our ushers will be handing out Jonas Bucks before the show. Offering baskets are passed out during the show. Please throw in your Jonas Buck into the plate when the baskets come around. Of course, if you do want to support Minneapolis Musical Theatre, visit our lobby where you can throw in a buck (or more!) to help support MMT. See? Crystal clear. No wondering about whether we should actually be digging in our purses and wallets--they tell you exactly what to expect and do. And they really limit what they ask of the audience and how long. By the time they want you to put your hands in the air and clap along, you are ready and willing. Minneapolis Musical Theatre has had a fantastic season. Starting with the wonderful Murder Ballad at Bryant-Lake Bowl, then Silence: The Musical at the Lab Theater (saw it twice, and that's saying something), and now Leap of Faith. They just keep getting better and better. They've always been scrappy and put on shows with SO much heart, but now they are really upping their game on the technical expertise side. I can't wait to see what they will bring us next season!